PsychTests.com’s latest study indicates that leadership style doesn’t come in cookie-cutter form. They uncovered a group of very distinct types of leaders with different approaches and strengths. 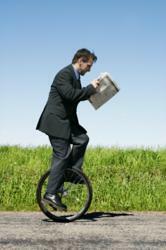 Today's leadership is a balancing act. Eclectic leaders are social chameleons, and can draw from and use all the different leadership styles, depending on the situation or the people they are leading. Nowadays, leaders need to wear many hats. They need to be able to develop both the human side and product side of a business – if you have just one or the other, you greatly limit yourself and the success of your business. What type of person is most likely to be a successful leader? Is it the compassionate mentor who empowers his/her followers, or the firm director who works hard and sets an inspiring example of perseverance and dedication? These are the questions that researchers at PsychTests endeavored to answer. 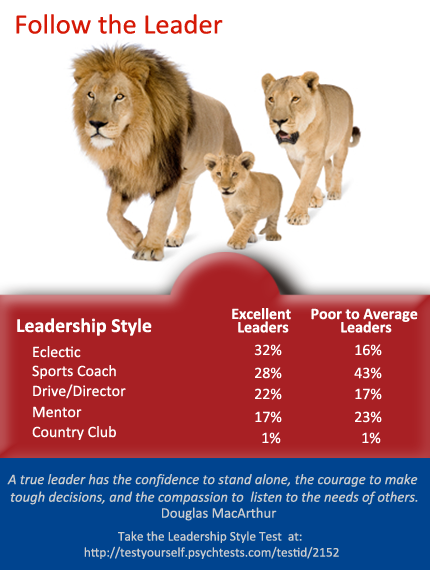 Their analysis of 7,170 leaders revealed five distinct leadership styles. From a sample of 34,700 people who took the Leadership Style Test, PsychTests researchers selected people who occupy a leadership position and used their most recent performance ratings to categorize them as excellent, good or average/poor leaders. Five specific types emerged from their study. Develop their staff to become self-sufficient, confident, and independent. Continuously set goals and inspire others to achieve. Have an energetic yet firm demeanor that commands respects. Give credit when it’s due and will compensate hard work and dedication. Will not delegate responsibilities – they draw a line between leader and follower. Will not endear themselves to others. These are no-nonsense leaders who are outgoing but will keep their relationship with their staff strictly professional…they will not become anyone’s friend. Can be short-tempered and might be difficult to get along with sometimes. Don’t possess a great deal of long-term vision – focused on accomplishing short-term goals. Hands-on leaders who will roll up their sleeves and work just as hard as the next person. They encompass the true value of hard work. Know exactly what they want to achieve and how to get there. Very ambitious and goal oriented, with a clear, long-term vision. Very determined and perseverant - once they set their sight on an objective, they will not stop until they attain it. Firm leadership style – slackers will be set straight immediately. Have a great deal of respect for people who are willing to work hard. Will not delegate their leadership responsibilities – which can often mean they will work longer hours to get things done, because they don’t trust anyone else to get their part of the job done well. Don’t mince words or use flowery language to inspire others. They dictate orders and expect them to be done without question. Are not skilled in developing people. Would work better with an established, experienced staff. Can be “rough around the edges.” Not the type of leader to be trifled with, as they are not likely to give too many second chances. Strive to bring out the best in those they lead, and willing to spend the necessary time and effort to do so. Will progressively delegate tasks that involve more and more responsibility, in order to empower employees and increase their confidence and independence. Believe that people are the most important resource a company has. Would rather work as a leader “behind the scenes.” They are not comfortable directing a large group, and prefer to work with people one-on-one. Not a very outgoing or charismatic leader. Would not thrive in management of production and operations. They are people-oriented, not product drivers. Don’t possess a long-term vision; they focus on the day-to-day functioning of their staff. Big-picture leaders who are master networkers. Good at schmoozing and drawing in customers. Possess a dynamic and charming personality. More of a figurehead than leader. They are not very involved with their staff and prefer to simply pass orders down the chain of command. Not very hardworking, at least not in a practical sense. They delegate the more nitty-gritty tasks to others. Understand the importance of nurturing and motivating staff…but will leave that duty to someone else. While the Eclectic approach seemed to be prominent among excellent leaders, poor to average leaders tended to fall in one of two extremes. According to PsychTests’ research, they either focused too much on the performance/production side of leadership (Sports Coach style), or they focused too much on the people side of leadership (Mentor style) – to the detriment of both. The HR version of the Leadership Style Test is available in ARCH Profile, the professional testing platform offered by PsychTests. For more information, visit ARCHProfile.com. PsychTests AIM Inc. originally appeared on the internet scene in 1996. Since its inception, it has become a pre-eminent provider of psychological assessment products and services to human resource personnel, therapists, academics, researchers and a host of other professionals around the world. PsychTests AIM Inc. staff is comprised of a dedicated team of psychologists, test developers, researchers, statisticians, writers, and artificial intelligence experts. The company’s research division, Plumeus Inc., is supported in part by the Research and Development Tax Credit awarded by Industry Canada. President of PsychTests AIM Inc.
32% of leaders rated as "excellent" adopt the eclectic style.The underperforming leaders tend to have an unbalanced style, which is likely why their performance as a leader was not rated well.